Flat Iron Steak is an extremely flavorful, amazing cut of meat. It is the most juicy and tender steak when cooked to perfection! This delicious flat iron steak recipe is soaked in an Asian steak marinade, seasoned with a little salt and pepper, and is grilled 4 minutes per side for medium rare on a hot preheated grill. WHY IS FLAT IRON STEAK SO FLAVORFUL AND TENDER? Flat Iron steaks are the second most tender cut of beef next to the tenderloin. Also known as top blade steak, this cut of meat is evenly richly marbled and comes from the beef chuck shoulder clod with the connective tissue removed. The flat iron is one of the juiciest and flavorful steaks you can quickly cook or grill with just salt and pepper. Its natural beef flavor makes it one of the most popular and affordable steaks you can buy with all the quality of expensive steaks often found on restaurant menus. For the record, I think it tastes better than its more expensive counterparts like New York strip and comparable to filet mignon. To experience the great beefy flavor of a flat iron steak, all the steak needs is to be rubbed with a little olive oil and seasoned with salt and pepper. The steaks should be cooked medium-rare and no further done than medium. Otherwise, the steak will become less tender and tougher. One of the best qualities of the flat iron is its thickness. As its name suggests, the steak is flat and not too thick – slightly thicker than 1-inch. This makes the flat iron steak ideal for home cooks who want to cook a fast weeknight meal. Whether by itself or cut into thin strips for salads and tacos, this steak will not disappoint you and will become your new favorite cut. The two best ways to cook the flat iron steak is by either grilled in a hot preheated grill or by pan-seared in a hot cast-iron pan. Allowing the steaks to come to room-temperature by setting it on the counter for 30 minutes before cooking will ensure the steaks are not raw in the middle. Whether grilled or pan-seared, both methods will require cooking the steak about 4 minutes per side for medium-rare, and 5-6 minutes for medium. Grilled flat iron steaks is my preferred method of cooking. 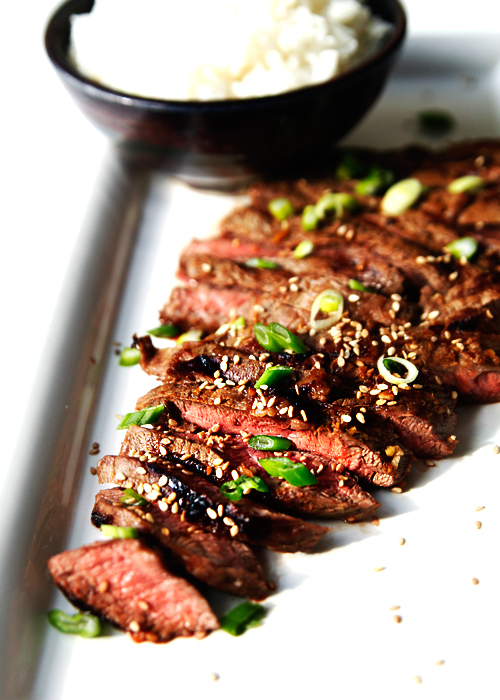 This flat-iron Asian steak marinade recipe is so good and slightly adapted from The Pioneer Woman. The recipe is from Ree Drummond’s Black Heels to Tractor Wheels book where she prepares her husband, the Marlboro Man, a flank steak dinner in their dating days. I love the headnote, “Finished product should not look like leather.” – Amen to that, sister! In this version I decided to use flat iron steak because it’s a little bit more juicy and tender than its flank steak cousin. You can use this steak marinade for different cuts of meat. The Pioneer Woman uses it on flank steak, but I really enjoyed it as a flat iron marinade. And to make the grilled steak dinner complete, I also use a little bit of roasted sesame seeds and green onions as a garnish, but you can easily omit them. To make the marinade, whisk all the ingredients in a small bowl and then transfer to a ziplock plastic bag. Add the steaks to the marinade allow it to marinate for 3-6 hours before grilling. You can also prepare the steak marinade the night before so it will be ready the next day. As many of you know, I am a contributor to Ree’s Tasty Kitchen site. So listening to her story through the filter of our friendship and having spent a little time getting to know Marlboro Man made me love her and their story all the more. It’s so easy to look at her life through the lens of her blog and come to the conclusion her life is perfect. After all, she’s a celebrity blogger, New York Times Best-Selling Author, and is married to a very handsome cowboy. She beat Bobby Flay in a Throwdown. But when you read her love story, you realize how human (brokenness and all) she is. Update: When I originally wrote this blog post in 2011, I included a book review along with the recipe for this Asian-Inspired flat iron steak while drinking a glass of red wine. I decided to remove my review of the book from this post and give it its own page which can be found here. 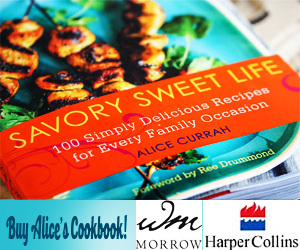 ALICE RECOMMENDS THESE OTHER BEEF RECIPES TO TRY! This book sounds super fun! I love chic lit too. And whoa that steak though. Yes please! The marinade is just over 1.5 cups and your 1.5 lb steak will work just fine. I find with flat iron, getting it down into smaller steaks is very helpful. Another tip a butcher one shared with me is to poke the flat iron with a fork all over before marinading to help it penetrate the steak deeper. Hope this helps! It says, 2 flat iron steaks, but how big should the steaks be for this amount of marinade? Does it matter. I have a 1.5 lb steak in my fridge that I’ll prob cut in half or thirds so the marinade gets in there better. This was so good!! And will definitely make it again. I didn’t change anything, which is rare for me. This is a delicious recipe, not a Geography lesson. Critical comments are rude. Wow, this looks so good! I must try! Can I use this marinade with chicken instead of steak with the same results? We don’t eat much red meat in our house. This was so good! My mistake was that I did not make enough! I can’t wait to make this again on father’s day to surprise my father-in-law. Is there anything I can substitute the sherry with? I don’t really use alcohol. Should I just eliminate it completely without substituting it with anything? Thanks for your help! I made this tonight and it was delicious! My hubby and daughter both loved it. I just bought your cookbook and I’m so excited to try more of your recipes. Hmm… I’d say Japanese. “Asian” isn’t really a good categorization being that Asia is a continent and the different countries make SUCH different types of food. Had this for dinner tonight and it was awesome! Even my picky 6 year old asked for seconds. Adding it to the rotation! Do you think it’s safe to marinate overnight or will the flavor b too overwhelming? I can’t wait to add this to my menu plan. Looks fantastic and I love using flank steak. Hmm didnt say how many teaspoons of red pepper flakes…im assuming 2? You can substitute sherry with white wine. If you do not want to add any alcohol, feel free to omit it. I think the sherry elevates the flavor slightly but many similar Asian recipes do not call for any alcohol. So so excited for this recipe!!! I found you on Pnterest. I can’t wait to read Ree’s book. Going to download it tonight. Do you use 2 Tbls of ginger or 4?